To conclude this summer’s Harry Potter mania, it seems fitting to study the HR implications of J.K. Rowling’s seven volumes. Her novels explore human nature, communication dynamics, moral dilemmas, and social issues, so why not use them as a source of business inspiration? Days later, Dumbledore asks Harry about his progress. After Harry describes his one measly attempt, Dumbledore sits in calm silence. He doesn’t yell or get mad. After a few moments, he simply responds, “I see. And you feel you have exerted your very best efforts in this matter? That you have exercised all of your considerable ingenuity? That you have left no depth of cunning unplumbed in your quest” to complete the assignment? Here’s the beauty of Dumbledore’s performance management technique: By staying calm, he keeps Harry focused on performance. Managers who lose their cool miss a teaching opportunity. Why? The employee’s focus shifts away from the business at hand to managing a volatile communication. 1. Recognize your prejudices. In the Potter books, we meet “squibs” (offspring who lack magical skill), “mudbloods” (witches and wizards with non-magical parents), giants, and werewolves. Various people shun them just because of their “status.” Managers: Who makes you uncomfortable? Discomfort often signals a lurking prejudice. 2. Treat people as equals, and they will give their all for you. Dobby, the house elf, blows his nose into his clothes, instead of using a tissue. Luna wears odd jewelry and rattles on about far-fetched topics that cause fellow students to label her “Loonie Lovegood.” Harry steadfastly treats them as equals. He listens to them and genuinely considers their input. Do you treat everyone as equals, regardless of their job or salary? When you do, they’ll go to the mat for you. 3. Choose competence over pedigree. Some think Hagrid’s lack of credentials should disqualify him from teaching Care of Magical Creatures, despite his clear gifting with critters.Are you passing over great candidates, because they have diplomas from community college instead of Harvard? 4. Pause before judging an employee’s potential. Neville Longbottom can’t seem to get anything right in the early books. In one class, he ends up suspended from a chandelier. Physically clumsy and lacking confidence, Neville becomes fodder for pranks and bullying. Yet he emerges as a key hero later on. Have you written off any employees as “lacking potential?” Take a second look. 5. Speak up if you see what’s holding an employee back. Neville is extremely gifted in herbology. But his grandmother thinks working with plants is a “soft” occupation and actively steers him toward another career. He begins succeeding when Professor McGonagle encourages him to play to his strengths instead of his grandmother’s whims. Millennials with helicopter parents may be marching to mom’s and dad’s rotors. Help young workers break the tether and find their own flight path. 6. Avoid saying “shut up and follow the rules.” That’s oppression, not leadership.Dolores Umbridge shows what happens when you saddle people with layers of regulations. Some lose their motivation, psychologically “check out,” and continue plodding along with their heads hung low. Others rebel in disruptive ways. The Weasley twins’ exit in Book 5 is breathtaking. Are your employees plotting dramatic departures? 7. Be humble enough to change your mind publicly. Harry Potter has many reasons to hate Severus Snape, who constantly makes disparaging remarks about the young wizard. But in the end, Potter gets new information that reshapes his thinking. Harry names his second child Albus Severus Potter in the ultimate public reversal of sentiment. Managers: willingness to admit mistakes builds workplace trust and respect. 8. Foster collaboration. Discourage “lone cowboy” mentality. Harry and Ron would not have survived without Hermione’s textbook knowledge. None of them would have made it without help from Aberforth, Order of the Phoenix, and Dumbledore’s Army. Does your organization reward prima donnas or great team players? 9. Break the elder wand. Power corrupts. Succeeding in business isn’t about collecting power. It’s about serving others and improving the world in some way. How are you personally making a difference in the workplace? This entry was posted in General, Management, Tips & Tricks, Uncategorized and tagged Harry Potter on August 31, 2011 by Bloomington Chamber Staff. 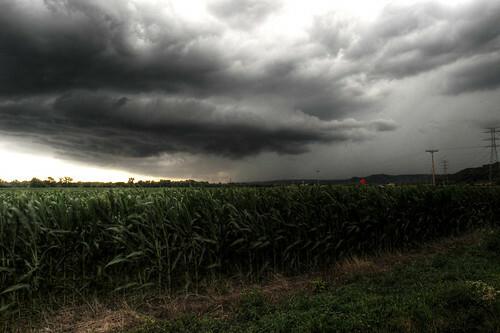 This photo was taken by an amateur Indiana Photographer from the Flickr Group "Indiana Thunderstorms." Click on the picture to check them out! With all the bad weather and severe storm warnings we’ve been getting in Bloomington lately, we figured it would be a good idea to write out some suggestions for designing and implementing your plan in case of an emergency. The magazine Communication Briefings published an article concerning this very subject. They outline a series of steps a business could take to control a crisis situation in a way that minimizes the effect the crisis has on regular business flow. Because this model is a great resource for coming up with your disaster plan, we wanted to share it with you! a. Create a plan for how your employees and associates would communicate during an emergency; Start by creating an outline of rules that supercede normal procedure. Perform mock drills, and make sure to candidly critique your own readiness and performance. Designate a crisis team who will take charge during an emergency. Organize your crisis team by determining assignments each member can assist with in the disaster, including a primary spokesperson position. Make sure to compose the following materials: an up to date list of possible media contacts, federal emergency agencies, and important contacts that will need to be notified about the crisis and could help. Step 2: Remember that perception is reality. Remember that rumor control is critical in the business world. Do your best to manage your crisis effectively, and avoid the assumption that everyone knows you are trying your best to control the situation. Rather, assert that you are with solid public performance. Step 3: Treat the event seriously. When working in the public eye, keep in mind that all of your words and actions should echo the compassion you feel for any and all persons effected by the crisis. React seriously as if lives, careers, and your business are on the line, because they just might be! Step 4: You only know what has been confirmed. Step 5: Communicate early and often. Like the previous step, do not make public comments until you have all of the facts. Make sure that you aren’t speculating, but early communication is just as important as accuracy in rumor prevention. As a rule of thumb: Provide as many facts as possible, even if they are little things like the square footage of the building or the number of employees that work on site. Step 6: It ain’t over until it’s over! Don’t assume because the story isn’t on the front page anymore that your business is in the clear. Make sure to reassure your important customers and business associates that everything is okay. Step 7: Get back to business. Make sure to get back to business as soon as possible. This will show customers and clients that your business won’t let a crisis like this prevent it from functioning normally. Be prepared for media. They may want to film you back at work, so make sure you are ready! Hopefully, these steps will help you create an emergency plan, especially in case Bloomington continues to receive the crazy weather we’ve been having this spring! Stay safe and dry out there! This entry was posted in General, Tips & Tricks on May 3, 2011 by Bloomington Chamber Staff.